Over the past month Crude Oil prices have slowly, and quietly climbed back up near the feared $80/barrel price. Right now, crude is quoted at $77.29. Amid this rally, we have noticed that investors in oil stocks seem to be shifting their attention away from crude prices and towards market trends, and primarily earnings numbers. 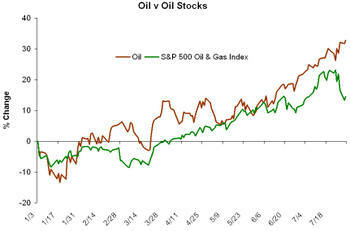 Below we show the year-to-date performance of the S&P 500 Integrated Oil & Gas Index, versus crude oil prices. The index is made up of: CVX, COP, XOM, HES, MRO, MUR & OXY. Last week we highlighted where the S&P 500, Dow Jones Industrial Average, and the 10 S&P sectors were in relation to their trading envelopes and moving averages. 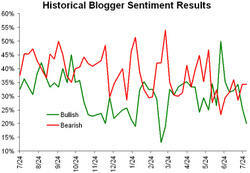 After several volatile sessions we are revisiting the same charts with updated information. 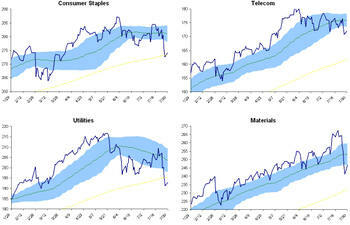 We noted that Technology, Industrials and Energy all gained nicely off of their 50-day moving averages, with Consumer Staples gaining off of its 200-day. 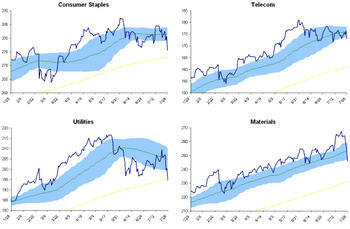 We have noticed that momentum has come more into play as this bull market has matured, so watch these sectors to make further gains (unless they break down through their moving averages). 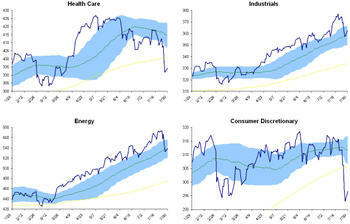 The rest of the sectors and the market remain in areas of uncertainty. 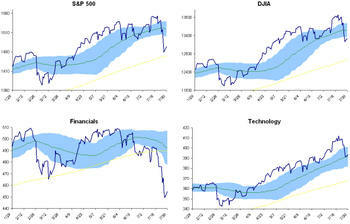 The S&P 500 has continued to under perform the DJIA, also showing more volatility. Today's gains, while significant, did not erase Friday's losses. While more dramatic losses would be surprising, further volatility is to be expected. 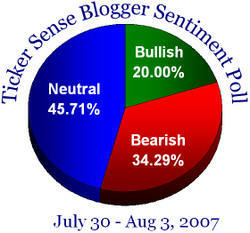 This week volatility has our bloggers' attention, as the number of bulls declined but the number of bears is unchanged. 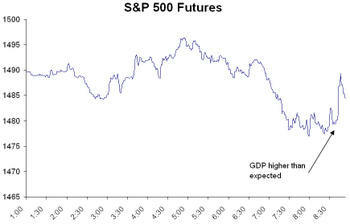 Anyone tuning into CNBC this morning would have heard the buzz about the volatile futures market. Down as much at 11 points earlier this morning, S&P 500 futures poked their head above water only fall again, now down 3.4 points. 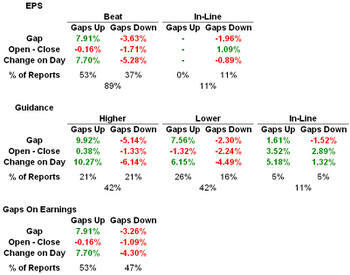 Over the past week much of the market's gains or losses have been made during after hours trading, with the change reflected in the first half hour of trading. In other words, if the market opens down it has stayed down. After such a big move in the US stock markets yesterday we highlight below where the Dow, S&P 500 and all of its ten sectors are in relation to their "normal" trading ranges. Those familiar with the matter know the highlighted range as the Trading Envelope. The financial sector has lead the market lower, sharpening its decline over the last month. The worst performing sector yesterday was energy, down 3.67%; with materials closely behind, down 3.63%. The only Dow component remaining in the green at the end of the day was MMM, up .48%; with AA far and away the worst performer, down 7.11%. As we noted in an earlier post, the Dow has continued to outperform the S&P 500 as the S&P has now moved into oversold territory. The only sectors remaining neutral were: technology, industrials, and energy; with the rest oversold. There are currently no overbought S&P 500 sectors. Do you ever wonder why we don't have many posts on big days like today? Birinyi Mini-Institutional clients get the most proprietary and up-to-date information we offer. Our Strategy Bulletins are released on an ad-hoc basis and cover exactly the types of events we saw in the market today. The Birinyi Monthly Newsletter will be sent to our distribution list via email at 6pm this evening. Subscribe today and receive the sector timing model detailed below, Laszlo Birinyi's personal market commentary and insight, and the three Birinyi Portfolios. A new addition to the Birniyi Monthly Newsletter is our Marking Timing Model. 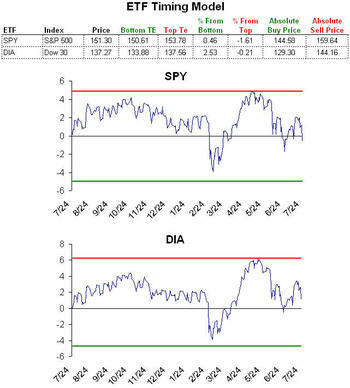 Illustrated below for the DIA and SPY ETFs, the model shows the percent spread between at security's price and 50-day moving average. The red and green horizontal lines indicate high and low extremes. 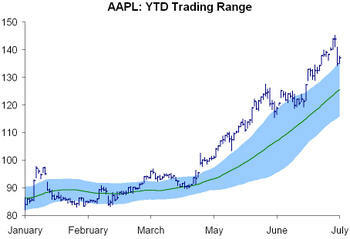 These lines are meant to indicate where a stock or sector is in relation to its normal trading pattern. As part of the Newsletter Service we analyze each of the ten S&P 500 sectors. Over the past month we have heard particular attention paid to large share repurchases and that they are buoying the market. On 6/22 Reuters published that 340 companies had announced $178b in new buybacks during the second quarter. Our data showed 391 announcements totaling $215b. On 7/18 the Wall Street Journal ran a story stating "Companies announced $157.4b of buyback plans during the quarter." 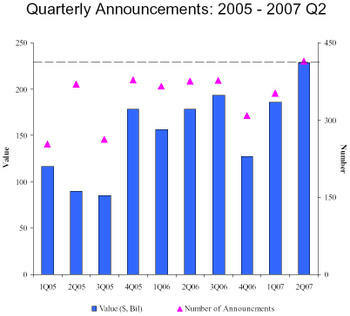 Our data show 414 announcements totaling $228.9b for the second quarter. For more in depth research and analysis, subscribe to the Birinyi Mini-Institutional Service.